Looking for the easiest homemade pop tarts ever?! Look no further! 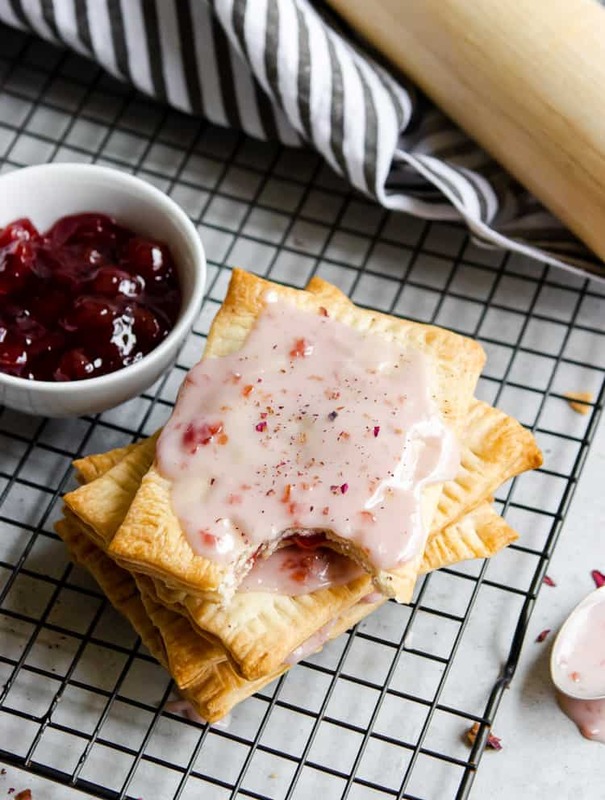 These delicious and simple pop tarts are made your way and in no time! Have it your way and enjoy this easy breakfast recipe! Not too long ago, I did a survey on Instagram to see what everyone’s favorite Pop Tart flavor was growing up. I then quickly fixed that to say what IS versus what WAS your favorite flavor because who says we don’t love them now?? I learned very quickly that my followers are VERY passionate about their Pop Tart flavors. VERRRRY passionate. I mean, I got responses that basically said their flavor was the best and to spit on all the others. Now, come on, that is a bit too much right? Not for my people clearly! Since there was such a large variety of faves I didn’t completely get what I was looking for in the first place. 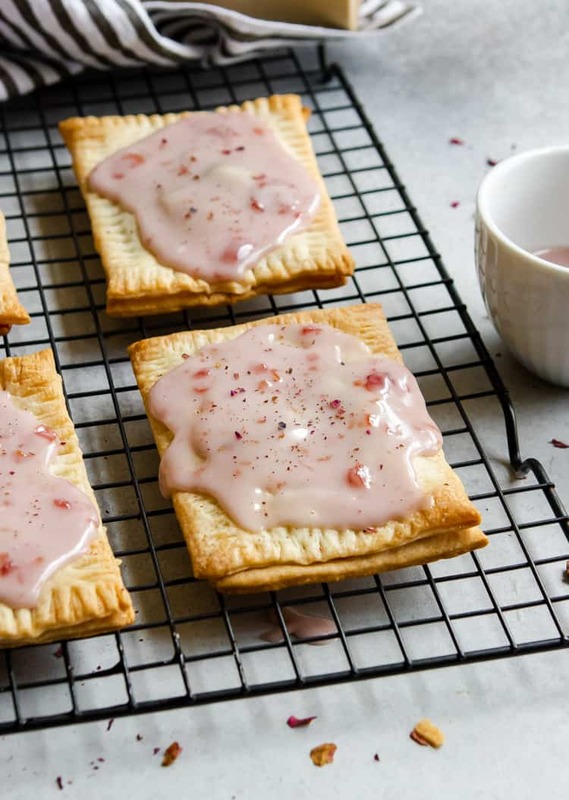 When I asked, it was because I wanted to decide what flavor I should try to make when I ventured out to make the easiest homemade pop tarts ever. You know, one that the majority would agree on. But I learned quickly there was not going to be a majority. There were certainly a few that I found had a lot of votes: Strawberry Iced (with a few that said no icing please), Brown Sugar Cinnamon, and S’mores. To be fair, I don’t think S’mores wasn’t even an option when I was a kid so I am going to have to go get some and test them out to see if they are all the rage. Long story short, I did not feel one Pop Tart flavor stood out and thus, I had to decide just what flavor I would make. But here is the thing. 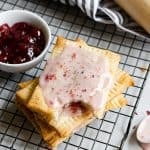 My goal was to bring you the easiest Pop Tart recipe ever and if I pigeon hole you into a certain flavor, then you may miss out on exactly what you want. The more and more I thought about it, I realized that this recipe is so versatile that any fruit flavor is certainly possible. THAT is what we need out of a super easy recipe–the option to make it our own way, that way everyone is happy! I could certainly make it, no doubt, but every time I think about making a recipe with pie crust, I put it off because I don’t have the time. Translation? I am too darn lazy some days. Homemade pie crust is great, but sometimes if it adds more mess, then I just don’t have the time or energy and then eventually I move on to something else. That’s why these are the easiest homemade Pop Tarts ever– pre-made pie crust. Genius right?? Indeed. You almost have to laugh as you cut the dough at how much time and energy you are saving. To be fair, you could most certainly use your favorite pie crust recipe, but I am a convenience seeker in the kitchen and so 99% of the time, I am sticking with the short cut. Sad, but true. Not only are these the easiest, I am here to say they are also better than the boxed version. And I love my Pop Tarts! The reason goes beyond just the fact that they are homemade. The big thing I find with Pop Tarts is that they are kind of dry. Not these little gems here–flaky and crisp on the outside but gooey gooey on the inside. Packed with delicious preserves or jam and then iced to your heart’s desire. Any pie crust will work. I opted for the kind in the refrigerated section in the grocery. If you have a favorite recipe feel free to use that. As long as it is a classic pie crust recipe, you should be square. Filling: You do you right here! Strawberry preserves, blackberry jam, mixed berry, apricot, raspberry, cherry–try it all! Pictured in this post is cherry preserves but I am also a big fan of strawberry. You could whip up some homemade chia jam as well if that sounds like fun! Don’t over fill these. Just trust me on this one. If you do, the jam will find it’s way out and then they are not quite so pretty. And who wants that?! The egg wash is not 100% necessary but I highly highly highly recommend it. Makes the edges so flaky and brown. The edges will be completely different without it and not quite as rich. Really work to press the edges closed as best as you can. I pressed mine together and then used the fork–this made a difference. A bit of jam in the icing helps bring out the color. You could also add sprinkles if you would like. Beat the egg for your egg wash in a small bowl. Lay out 8 rectangles on the parchment lined baking sheet. Add 1 1/2 Tablespoons of desired jam. 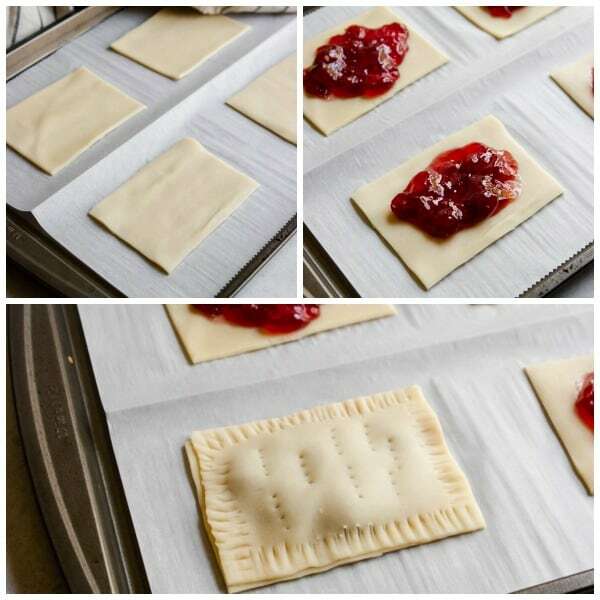 Brush the edges with your egg wash and then place another rectangle on top of the rectangle with the jam. Gently pinch the edges to seal and then using a fork, crimp the edges. 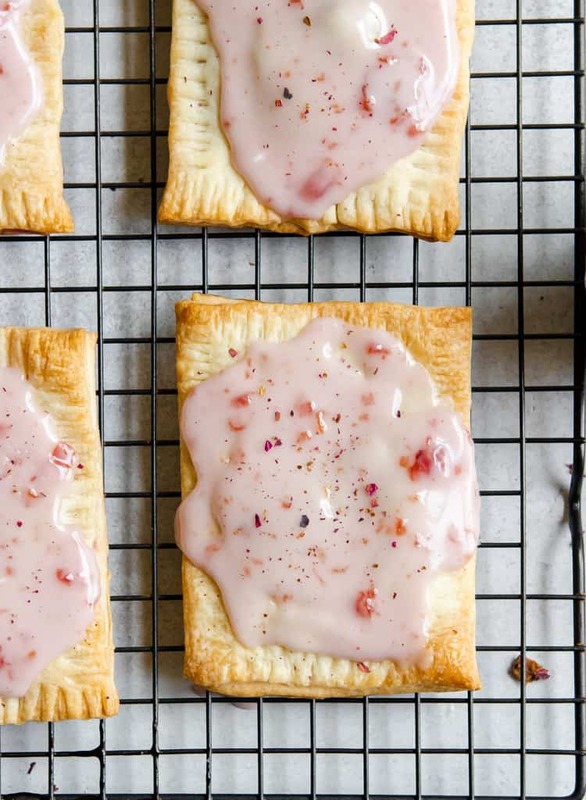 Poke some holes in the top of the pop tart and then brush the entire top, including edges, with the egg wash.
Continue with the rest of the pop tarts. Bake for about 12-15 minutes or until golden brown. I bet you that I’ve said that the next time I’m going to make my own pie crust more than you. 😉 I’m older than you, so that stands to reason! These pop tarts look scrumptious! I want to chime in with my favorite flavor growing up – chocolate, hands down. Then maybe strawberry! I can’t wait to make your recipe. Ha—I get it. It’s like why re-invent the wheel when the pie crust is there and ready!! Thanks so much Danielle! We really enjoyed them. A fun project for a rainy day with the kiddos. I make my own pie crust, also for pop tarts, BUT, there are some days when all I do is to grab the pre made one and it works so well and it takes me half the time to make them and with the rest of the time and I can do whatever I want 🙂 . Love the cherry flavor! Yea, there is something to be said for convenience some days! I don’t like regular poptarts (too artificial tasting in my opinion) but these look absolutely gorgeous and very tempting! This would be a fun recipe for a brunch. 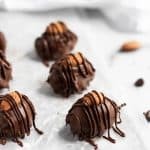 I’m saving this recipe! Awww enjoy Kate! I don’t want the other kind now that I have these! 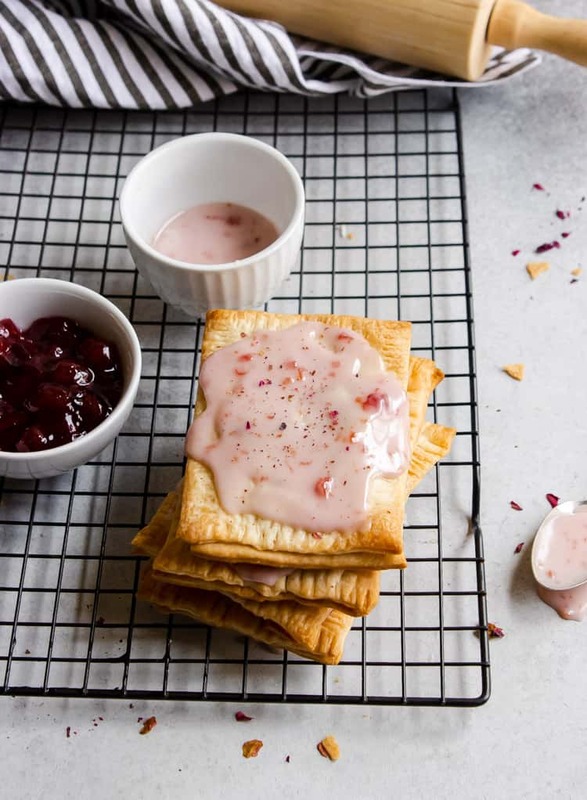 Poptarts are a childhood classic but homemade are soooo much better!! These look fabulous and so pretty! Agree. There is just something about homemade!